See Time For a Change for the first in this series, or check out the index for all the posts on Arch Linux. Today I'll finish getting email, calendar, and contacts working, which I started last time by working with the Arch User Repository. Kontact is the Personal Information Manager (PIM) that comes with KDE. If you've ever used the full version of Microsoft Outlook before, you've used a PIM. 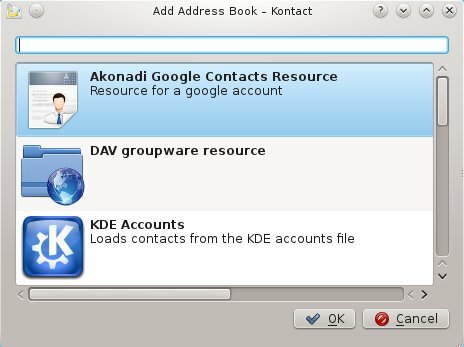 Kontact is actually one of the reasons I wanted to give KDE a try, because from everything I've read, it is as well-integrated with the operating system as Outlook is in Windows, and has better extensions for synchronizing with information sources like Google. As an Android user, Google integration is a key feature for me - I find it frustrating that keeping contacts and appointments synchronized seems to be so difficult for the big boys (Microsoft and Apple) to handle correctly. I realize this is by design, of course. Outlook has no revenue value to Microsoft without a big Exchange Server license, and Apple wants your eyes on iTunes, not Google services. Too bad. This is my computer, and I'll make it do what I want. And that goes double for my phone. Installing Kontact isn't necessary, since it comes with KDE. But getting it to integrate with Google information services takes a little more work. I installed those extra things last time, and now it's time to get them configured. Even before I get started, I can hear you thinking, "geez, this is a lot of work, why don't you just use Microsoft Outlook?" And yes, it's a bit of work. But it's worth it to me to have all my contacts, email, and appointments synchronized across my phone and computer without having to run a big wasteful server in my house. Besides, the Exchange Server at your office that provides all these services is just as hard to set up and maintain (maybe harder), and it doesn't even integrate with anything other than Microsoft Exchange! 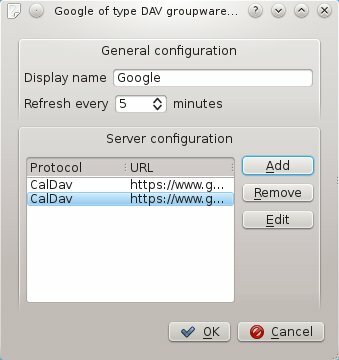 Try this little experiment: call your IT department and tell them that you want all your Google contacts to show up in your address book in Outlook, and insist that you want to be able to edit them within Outlook or on your phone, and have the changes automatically show up in the opposite location. Now, while you deal with a very annoyed IT department, I'll go ahead and set this all up for myself with no dedicated hardware and no capital expense... in a couple of evenings. 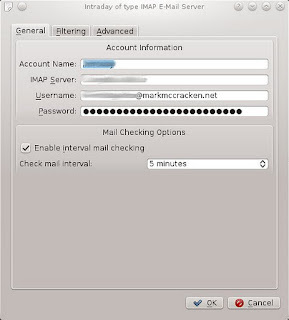 KMail is the email component of Kontact, and configuring it is just like configuring any other IMAP client. I added accounts for each of my main email boxes, setting my login and password for each. I set up an outgoing persona and hooked it up to my primary email box with authentication so that my email provider would forward my mail out to the world for me. And then I selected the inboxes from each of my email accounts as "Favorites" so I wouldn't have to search through all my folders to see what spam I had. 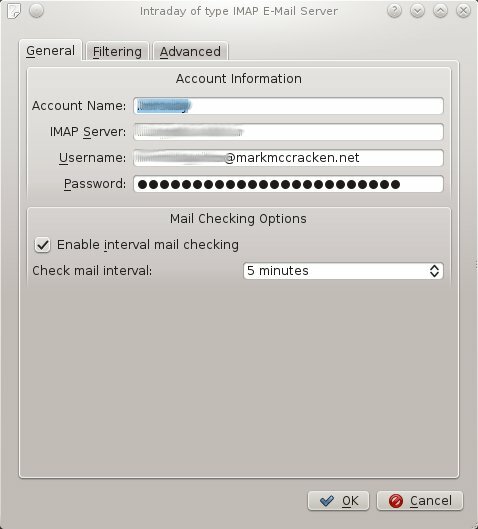 KMail is not as easy to use and customize as Thunderbird, but I can get used to it. Here's a screen shot, in case you've never seen an email client set up before. 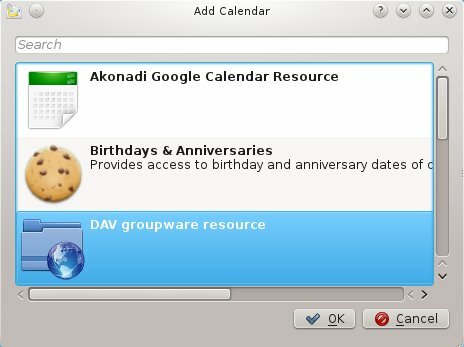 Akonadi is the KDE information service, providing contact, calendar, and general file-indexing services to all KDE applications via a unified API. If this sounds complicated and error-prone, then you are very perceptive. I want to set up Akonadi to use my Google contacts and calendar, and I have two calendars I want to access: my personal calendar, and the shared calendar that my wife and I use to track our joint plans. In my previous post, I installed the pieces necessary to make this happen. Now I need to configure them. I start by going into the Contacts section of Kontact (anyone else see the naming oddity here? ), and deleting the empty local-storage contacts list that Kontact provides by default. Having that will just lead to confusion later. Next, I right-click in the same pane that the contacts list was in, and select "Add Contact List". At this point I'm offered a choice of what kind of contact list to add. Since the installation of akonadi-googledata went smoothly, the first one on the list is "Akonadi Google Contacts Resource". Clicking on this asks for my Google email and password, and after supplying that, all my GMail contacts download into the contact manager, as simple as that. Since my Android also uses my Google contacts, any changes I make in Kontact will show up on my phone automatically. Contacts were the easy part - now for the calendars. 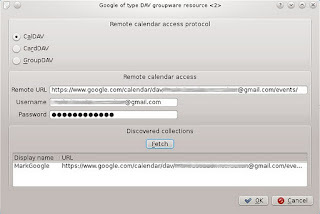 As with contacts, I start by switching over to the Calendar (not Kalendar, that would be silly) section of Kontact and delete the local calendar defaulted for me. 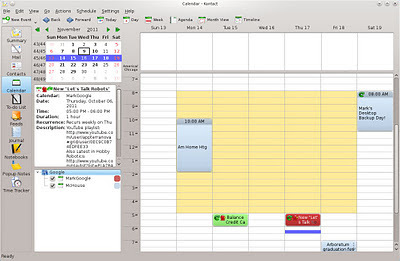 Then I right-click in that now-empty pane and select "Add Calendar", which greets me with a similar Add window as before. 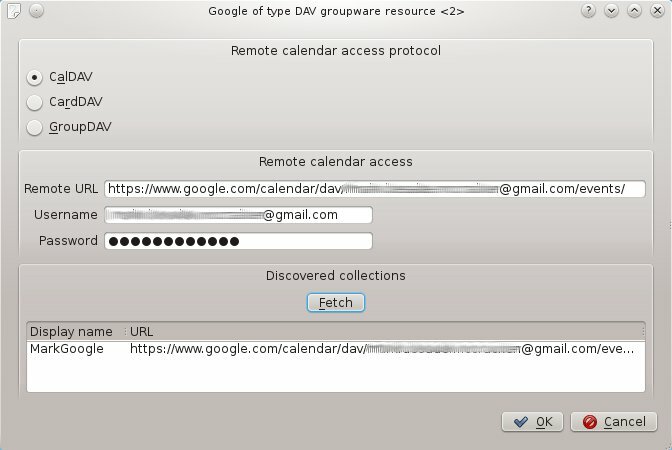 But this time, instead of selecting the Google Calendar Resource, we want the choice labelled "DAV groupware resource." 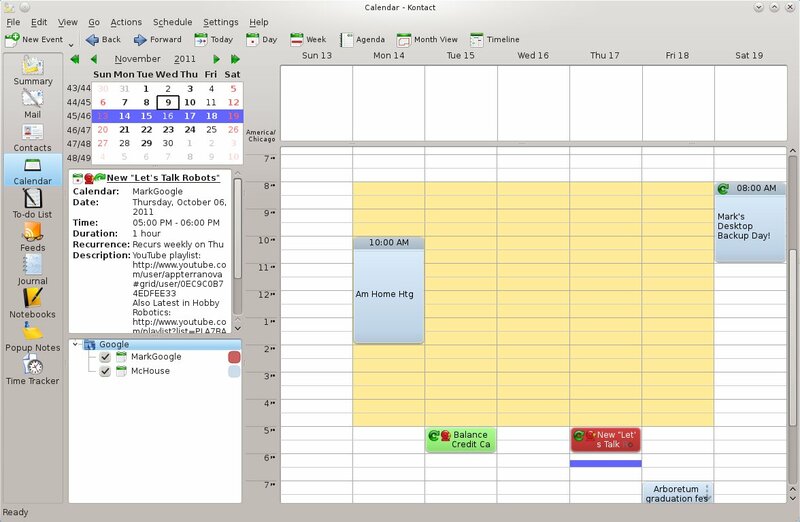 This is a standards-based interface, and actually works better with Google Calendars than the other, more intuitive choice. But the setup isn't intuitive at all: the next dialog that pops up is a Logon Credentials window, which I have to Cancel to proceed. Yes. Click OK, and all my appointments download into the Calendar. It's a pretty light week, thankfully. There's still a ton of look-and-feel setup to do, but the important part is that it all works and it's all integrated. The little customizations and tweaks can be done as I use the software. Kontact for e-mail, contacts, and calendar DONE! Thanks for this post. I save one or two hours with it !